Why fly when you can train! 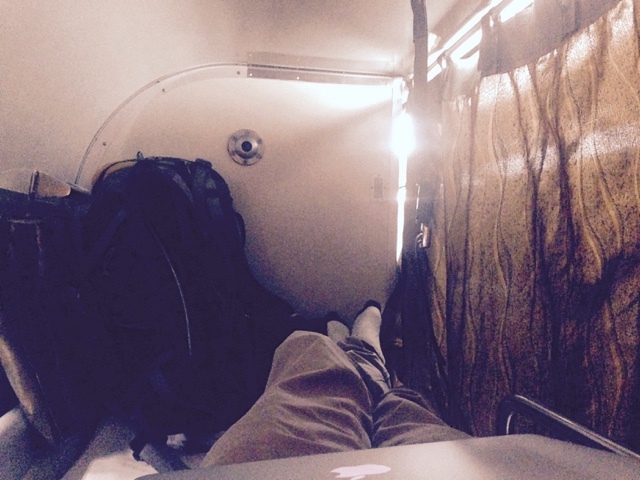 My train journey from Bangkok to Singapore. In Southeast Asia there is an abundance of low cost airlines covering the region extensively, offering extraordinary low fares that enables quick and efficient travel. Although we all need to use these convenient flights, enabling us to see ‘more’ of Southeast Asia, well at least the main cities, cheap airfares have forced us to neglect everything that is in-between. A regular Southeast Asian vacation could include Singapore, Kuala Lumpur, Phuket, Bangkok and Chiang Mai - primarily flying between each city or region. However what about all that is in-between? What are we missing? We are missing the real Malaysia, the real Thailand… Train travel is easy (practically), efficient (pending on what your definition of efficient is), affordable (totally), comfortable (compared to…well, I think it is comfortable), safe (absolutely - minus a few derailments that regularly occur) and offers a cultural and historical experience that a one hour Air Asia flight will neglect. I mean, a one hour Air Asia flight will offer a ‘cultural experience’ of uninterested cabin crew who regularly stand at the back of the aircraft and eat fried chicken mid-flight, a lack of safety standards, and pilots who seem to enjoy flying through very large cloud systems. However I decided to take the train from Bangkok to Singapore, a three day journey that is not appreciated and respected like it should be, as it offers a sensory and cultural overload. The journey starts in the chaotic and historical Hua Lampong station, where there are numerous monks, locals, tourists and officials all waiting to board a train, or just randomly hanging out there. The tired and outdated station is full of life, with the brightly coloured orange robes the Monks wear adding flamboyance and exoticism to the dusty superstructure. Touts and taxi drives are eyeing off tourists, in an attempt to sell them a product they most likely do not need, however can easily be convinced in a sea of chaos and uneasiness. On the large live signage board, the word ‘delayed’ is common, however the delays do not seem to be of any enormous length or any different to the common delays one experiences with Air Asia or Jetstar. The train, full of Thais, Malaysians and numerous hippies, or more appropriately put, western tourists that have stayed far too long backpacking around Southeast Asia, departs Bangkok’s Hua Lampong railway station at 2:45pm. 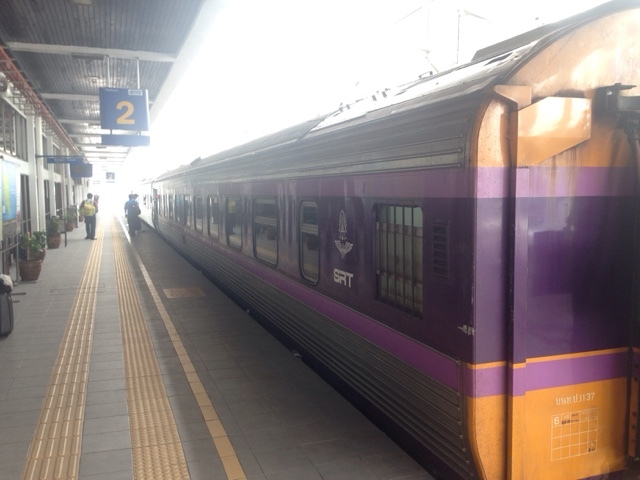 The first two hours consists of the train going no faster than 30km per hour, regularly stopping, due to Bangkok’s overused, underfunded and outdated rail infrastructure. This means you get a good two hour behind the scenes look at suburban Bangkok and the locals who reside along the railway line. Children play on the edge of the track, dogs look for food in piles of rubbish that are endemic along the rail corridor, and there is endless construction, which also contributes to the slow speed of the train. In its ugliness, Bangkok becomes strangely beautiful, a somewhat organised mess, easily witnessed from within a train. Although the train is clean (I am sure not my mothers definition of clean), except for the abhorrent bathrooms, the train is old, tired and in need of much maintenance. It is comfortable and the seats are incredibly relaxing, however it is obvious the Thai Government does not put much time and effort into the rail system. They also have the tendency to make the temperature in the train similar to that of an Arctic winter, and it is highly recommended travellers take ample protection from such weather. Although having your own music is beneficial to any traveller, listening to the conversations around me where both hilarious and ridiculous. One American ‘hippy’ tourist was attempting to explain Thai politics to an Indonesian couple, clearly demonstrating he had no idea what he was talking about. Another American, this time I am assuming a missionary, was explaining to a Thai women why she should become Christian. In the morning I overheard a Thai businessman tell a Malaysian tourist that the new Thai high speed train system will be up-and-running next year (clearly incorrect as this project has not started yet), but inevitably meaning the Malaysian will return home to spread this incorrect good news. The ASEAN rumour mill, a fascinating channel of incorrect information, available on trains, planes and airports, is fascinating and out of control. It is obvious local Thai passengers and the train staff are uneasy and confused by the unkempt, rancid smelling, boisterous and confused western ‘hippy’ tourist. However the western tourist is also befuddled by the train and its unique features, and often you can hear “did you see that strange toilet”? The rambunctious voices the majority of tourists have overpower the sweet and quietly spoken Thai, and it is obvious the Thais are once again frustrated by ‘hippy farang’ in their country. It is unruly to drink alcohol onboard yet many tourists do, and you are forbidden to smoke, yet I witnessed 4 tourists smoking. The “when in Thailand I do as I like” attitude is in full swing onboard! As we leave metropolitan Bangkok, the train snakes its way through overgrown tropical forest, rice paddies and small towns. Often the train stops at large towns, with the station always buzzing with passengers, monks, food stalls, stray animals, and what seems to be an over abundance of railway staff. Every time the train stops at a station sales people, selling all types of food, infiltrate the train, enthusiastically attempting to sell their products to relaxed passengers. “Anyone for fried chicken or pork sticks from a random person, in a random small town, at 9pm”? The train also has an eatery carriage and numerous attendants to sell you food products throughout the journey. For dinner I order an overpriced curry, that was poorly prepared and if not hungry, potentially uneatable. In fact I was surprised at how over priced the food was and the poor quality of the limited selection. However I also now understood why the majority of Thais on board the bring their own food, which unfortunately gave the carriage a constant smell. One elderly lady had a small chopping board in which she used to chop small vegetables, before placing them in a large bowl of hot water. I am also constantly bewildered in how much and how often Thais eat, always opening their large ‘food bag’ to bring out another delicious item, assisting Thai sugar companies maximise their profits and putting a strain on the well-funded Thai medical system, with their future diabetic habits. However it is exciting and always intriguing to see what they will bring out of their bag next. I guess, secretly, I was jealous. In the early evening passengers begin requesting the train staff to turn their seat into a sleeper bed. This requires the onboard ‘engineer’ to use a few tools, pull down the upper berth, put cushions in place on the lower berth and literally make the bed with sheets. The bed is incredibly clean, comfortable and has a curtain you can pull across for privacy. The lower berth, my berth, has the large window, thus you can lay in bed whilst still enjoying all outside has to offer. Although the train is, at times, incredibly bumpy, surprisingly it is easy to have a good night sleep. Occasionally I would wake up to observe our location or to watch the abundance of activity at a station we had stopped in. A word of warning though, it is better to be thirsty during the night than having to regularly go to the putrid smelling bathroom. After 10pm the cleaning attendant no longer cleans the bathroom, thus a smell quickly builds up, primarily due to the difficultly of ‘aiming’ when the train is so turbulent. The scenery changes as we travel through Southern Thailand, passing through jungle, palm oil plantations and rubber tree (plantations, I think that best describes them). Instead of seeing the common Buddhist temple, there is now an abundance of mosques, with men and women alike commonly wearing Islamic attire. Small children run around in thobes (white Islamic clothing) and halal certificates are noticeable on some small shop windows. During the night Thai police walk up and down the train regularly, heavily armed, and not looking overly impressed they were assigned rail duties. In the morning, after waking up and laying in bed watching the sun rise over the Andaman Sea, the reverse process goes into motion, with the onboard ‘engineer’ transforming your very comfortable bed back into your original seat. Again, in the morning the bathrooms are no where near as clean, if clean is what you would call them, as the night before, and the staff all look fatigued and in a less ‘customer focused mood’. Some sit in the back of one carriage smoking with their shirts half off, with a complete neglect for their job, primarily because they know their shifts are coming to a end, and that they were so far away from Bangkok, that well, who gives a damn. Not long after the last Thailand stop, Hat Yai, the train enters Malaysia and upon crossing the border stops at the border checkpoint, Sungai Basar. Once the train stops all passengers disembark with all their belongings and proceed into a small building that hosts both the Thai and Malaysian immigration authorities. Unusually the Malaysian officials direct us to a small booth, where a uninformed Thai official, wearing black pants and a white singlet, places an exit stamp in our passports. We are then ushered to the next booth where a Malaysian immigration officer, who is neatly uniformed, stamps our passports. Following on, our bags are well searched, before we once again board the same train. The border was unusual, and unlike any other border I have crossed in the region. I only noticed one Thai official, no Thai flags, no Thai signs, and no evidence it was Thailand’s border. On the other hand there were dozens of Malaysian border officials and heavily armed police, with Malaysian and local state flags in abundance. It was as if the Thai officials completely abandoned the border, knowing and trusting the Malaysian officials were beyond their own capabilities. Or that it was just so far away from the seat of power, Bangkok, that once again, they did not give a damn. At Sungai Basar the food carriage, the engine and a few other carriages are removed, leaving only three Thai carriages left. A Malaysian engine was then placed in front of the now three carriaged train, and all the staff were replaced with Malaysian rail staff. 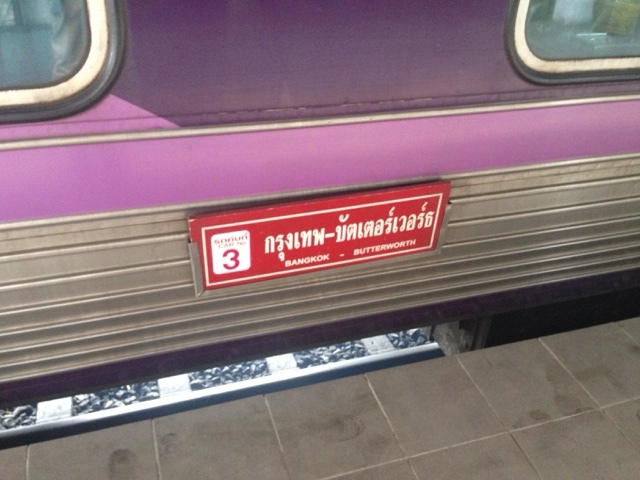 So I am now sitting in a State Railway of Thailand carriage, with Thai signage, with Malaysian staff, in Malaysia. I lack to understand why the Thai train is allowed to continue into Malaysia and why they do not replace it with an official Malaysian train. There were plenty of electrified Malaysian trains at the station ready for us to use! The Malaysian staff are more professional and it is obvious the railway system in Malaysia has had more investment (and a colonial history). The train goes significantly faster due to good conditions of the line, the stations are of immaculate quality with modern decor, with the food offered on the train now at a significantly lower cost, with more variety. Perhaps it is a byproduct of British rail infrastructure and adherence, as the rail infrastructure in Malaysia is of a high quality, when compared to that in Thailand, or even Australia (do not get me started on the horrendous state of trains in Australia). After crossing the border there is a dramatic scenery change, absolutely man made. The deforestation in Malaysia is frightening and most noticeable when crossing from a rather undeforested Southern Thailand, with palm oil plantations as far as the eye can see. Large limestone mountains, previously spectacular to look at, have been all but blown up in order for mining operations, and almost all of the jungle has been removed. Although there were obvious environmental problems in Thailand, a byproduct of Malaysia being significantly more developed, is the high cost its environment has suffered at the hands of economic development. 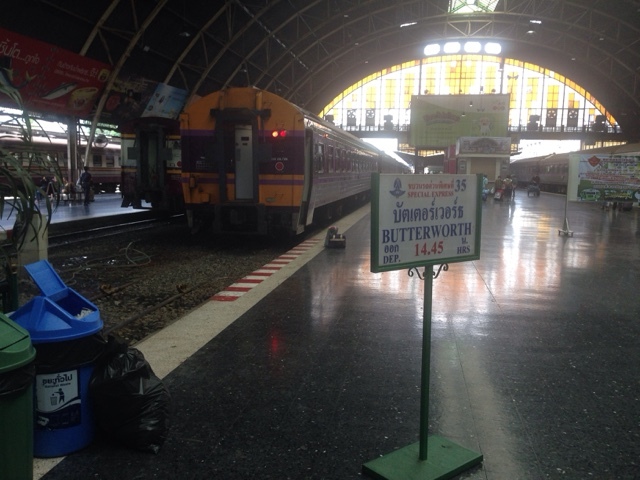 A few hours of travel through Northern Malaysia and we arrive at Butterworth, across from the beautiful island of Penang, and the end of the line for the Thai service. It is almost exactly 24 hours since I left Bangkok. If you are continuing, via train, to Kuala Lumpur or Singapore you must spend a night in Butterworth as there are no connecting services. I stayed opposite the station in a small hotel, and after checking-in, went to Georgetown on Penang Island for the afternoon. Gerogetown is perhaps the most quaint and historical of all the Malaysian cities, other than Malacca, due to it being a large British port throughout the colonial period. There are numerous museums and colonial buildings, and an abundance of religious buildings fill the small streets of Georgetown. It is common to see a mosque and church, and Buddhist, Hindu and sikh temples all within the same block. Early the next morning, at 8am, I walk back to Butterworth Station and board the Kuala Lumpur bound train. The train is of good standard, with lush and large seats, offering enormous windows that enable all passengers to observe the scenery. The eatery carriage is well stocked with numerous breakfast items, and it is pleasant to sit in there, reminding me of trains in France. As it was Ramadan, it was basically only the staff and myself in the eatery carriage, and a young chap that worked behind the counter who enjoyed having the music at a deafening volume. The staff, again in significant oversupply, with approximately eight sitting drinking tea, discussed and debated their love of the current political party, UMNO, yet their distain for the current UMNO Prime Minister. The debate was colourful and enthusiastic. They also had no knowledge of my understanding of basic Malay, making it a very interesting and humorous conversation. 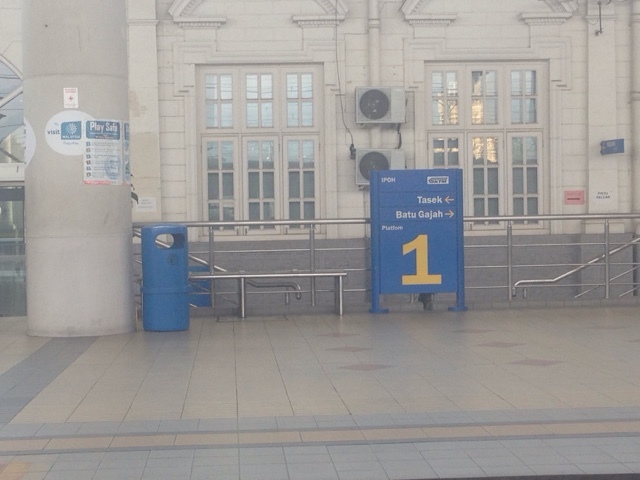 Roughly five hours later the train arrives in the very modern and large hub of hype, KL Sentral Station. 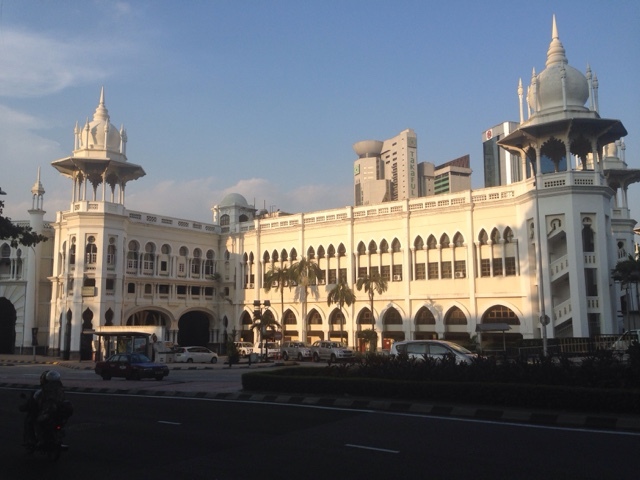 Now for a day enjoying Kuala Lumpur before retuning to the station for another overnight train journey to Singapore. Kuala Lumper, as always, was delightful, however the heat always seems to get me here more than it does elsewhere. At 11pm I board the Singapore bound train. The train was of higher standard again, of no more than ten years old. Although full, it was spacious, and full primarily of Malaysians. This time I opted for the top sleeper, which was already made upon me entering the train. Thus as soon as I boarded the train I was fast asleep and did not wake until 6am, upon our arrival at the Malaysian border check point. We all, slowly and in a sleepy daze, disembarked and walked up a large flight of stairs in a relatively new building, and lined up to clear immigration. We then all went through a very strict security check, before once again boarding the same train. The train departed, crossed the causeway, and two minutes later was in Singapore at the Woodlands immigration check point. In a zombie state, I left the train, lined up, and was officially in Singapore. Bangkok to Singapore by train. It is long, exciting, frustrating, amusing, challenging and absolutely worth doing. I was tired, worn-out and over trains, however I experienced so much more than I would have experienced on a mundane budget flight. Even if only once, and I only recommend it once, you must do it. You will both learn and discover so much more about this intriguing part of the world. Train it up! A University in Desperate Need - Mandalay University, Myanmar. I have just returned from a three day visit to Mandalay University where it was revealed to me the devastating situation universities within Myanmar find themselves in. I even struggle to use the word ‘university’, due to a lack of students, resources, facilities and knowledge. However I will continue to use the word due to the immense hunger local academics have for improvement, increased knowledge, academic independence and foreign assistance. The appalling state universities are in, within Myanmar, is the result of decades of deliberate neglect due to a fear of students and uprisings, during the period of military rule. There is still a lack of understanding of the necessity to reform the education system and there is an underlying fear from the current government that a strong education system means dissent and rebellion. During the time of the military junta universities were seen as little more than problematic havens of protest and left-wing influence, thus most of them were restricted, monitored or shutdown. Before entering the grounds of Mandalay University, one is reminded of the brutal surveillance the military had (has) over academia in Myanmar, with a large military barracks boarding the University perimeter. The all seeing eye of the Tatmadaw (Burmese Military) has strategically located itself next to a potential ‘hub of dissent’, always ready to travel one hundred meters to put a stop to ‘problematic youth’, who may attempt to ‘threaten their power’ or the ‘balance of power’. Upon entering the campus it is obvious there has been little investment in the University for numerous years. Many buildings are in a decrepit state and a few look completely abandoned. The main administration building is aesthetically colonial with a British officials name engraved onto stone near the entrance. Such grandeur, demonstrating Mandalay’s once colonial past, is almost lost in a jungle of ‘mess’, a desolated campus, and a almost ‘desperation’ the University radiates. A glimmer of hope is found in the recently opened ‘recreation center’, where there are signs of student life slowly becoming a reality, and a large on-campus guesthouse that numerous academics speak of with a sense of pride and joy. After a brief walk around the campus, we were introduced to our host, a senior Professor in Anthropology. Her warm smile, the elegant way she wore the traditional Burmese Hta-Mein, and nervous enthusiasm for our arrival, all clearly demonstrated the University’s desire for external visitors and assistance. We were taken into a large well decorated conference room, with one small portable air-conditioning that struggled to cool down a room situated in a building constructed in the early 20th Century (keep in mind it was 44 degrees centigrade outside). In the room there were over twenty academics, incredibly eager for foreign scholars to impart and share knowledge to them. The reason my team was there was to share and teach academic skills, in regards to an up-and-coming conference Chiang Mai University is co-hosting with the University of Mandalay. Although local academics from Mandalay University are wise and have a wealth of wisdom, it is clearly evident their learning style is archaic and they have little ability to provide critical analysis. Much of their knowledge is determined from no more than a few books due to a lack of funding, decades of restrictions, and a lack of research ability. All academics and scholars, no matter if they are a lecturer or senior professor, earn a standard wage of $300USD per month. They also get a university car, however many complain that university cars are in dire conditions. It is evident that with little or no financial incentive it is challenging for academics to be career focused, driven or inspired to continually improve themselves. On day two we conducted a workshop on essay writing so the senior academics could have a better understanding in how one writes for a international conference. It was clear that although we were talking to senior academics, they had little understanding of the ability to be critical or provide positive criticisms. There was also a lack of knowledge on recent events, which made analysis in the field of economics and social sciences very difficult. One Professor in Anthropology was still working with theories that were outdated in the 1970’s. Another Professor pleaded with me to return to Mandalay and attend her International Relations classes so I can help her teach students in an internationally acceptable way. Her passion was evident and encouraging, yet it was incredibly sad how senior staff had such a lack of knowledge. Of course, all blame must be directed toward the former junta. Myanmar is developing and the democratisation process is slowly underway, however it is obvious a significant roadblock to Myanmar’s development is and will increasingly be, education and the lack of it. Mandalay University has only recently reopened to students, having been shut down for decades by the government, and academic staff have little experience teaching and understanding academic material. Customs prevent academic debate and discussion amongst academics, let alone students debating or discussing issues with academics. Learning dates, facts and figures are paramount to the learning style, with no interpretation, argument or the challenging of historical discourses. Through their politeness, academics at Mandalay University understand the need, hence the enthusiasm in our attendance and participation. 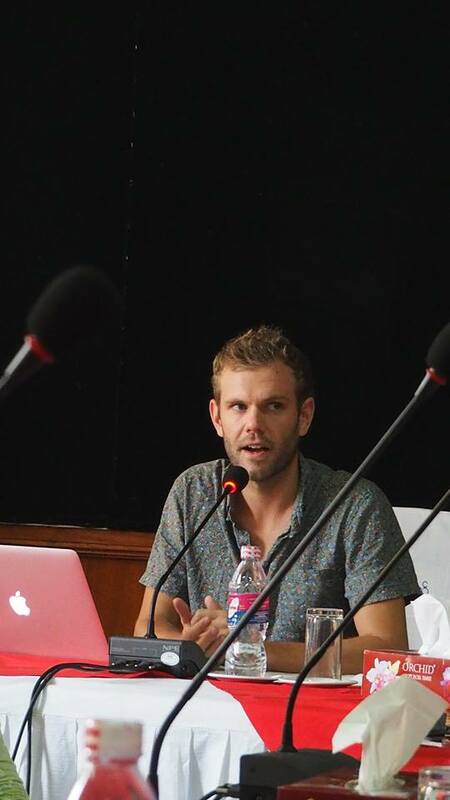 Much attention is given toward democratisation, security, ethnic rights, and health and sanitation by local and international organisations, and numerous countries, institutions and organisations focus on education, however if Myanmar is going to continue to develop, empowering its younger generation, more attention needs to be given to the significantly lacking tertiary system. There also needs to be pressure put on the government to give university’s like Mandalay University more independence, thus enabling the University to have enhanced credibility in the academic world. It is with little doubt I will be back to Mandalay University soon, as the journey the University is on and the impact it will have on Myanmar, is exciting, challenging and overwhelming. Kathmandu - disturbing yet confusing. Geopolitics and the Nepal earthquake. Sydney, you really impressed me! Thailand, sexualised and hierarchal - a problematic combination. What does last weeks protest in Bangkok mean and demonstrate? Political Islam and Indonesia - A few points worth understanding.